[November 26, 2018] Over the Influence is pleased to present Using All The Freedoms We Have, an exhibition of new works from the renowned Los Angeles-based contemporary artist Scott Campbell. 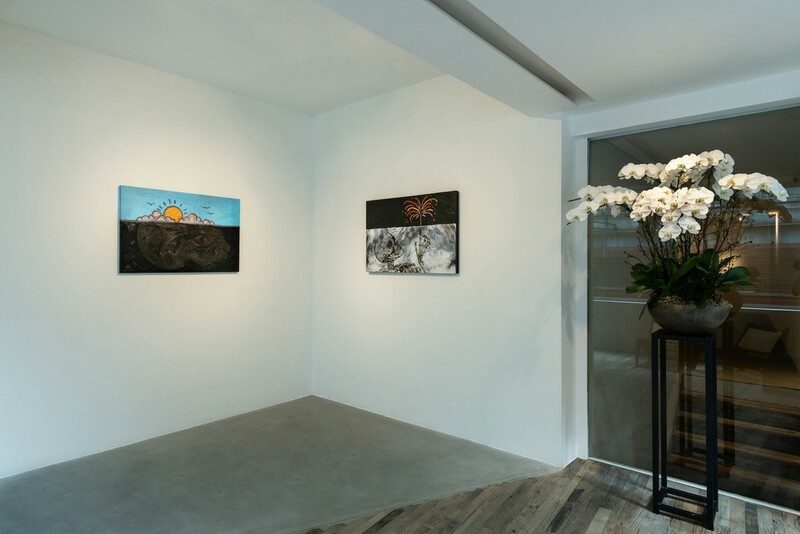 The exhibition, marking the artist's first solo presentation with the gallery, will open on December 14, and remain on view through January 12, 2019. 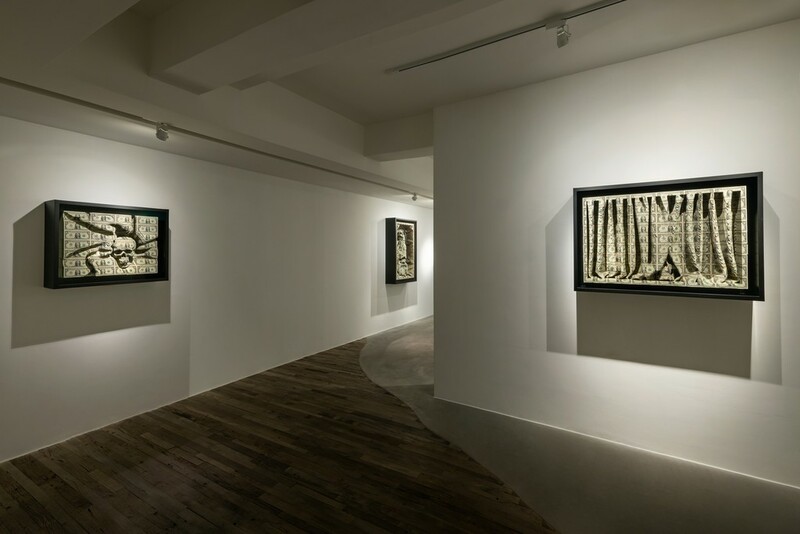 Integrating a mastery of craft and materials, the prolific Campbell's latest series continues his long-held interest regarding the pervasive influence of money on contemporary art. 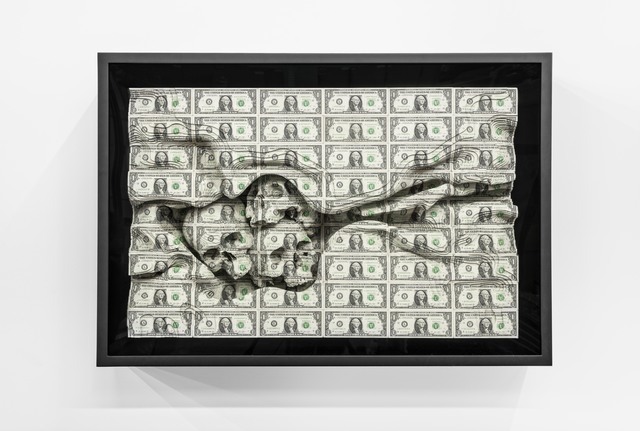 Exploring the intersection of art and commerce, Campbell's multi-layered paper cut sculptures ingeniously juxtapose iconic imagery with American currency. 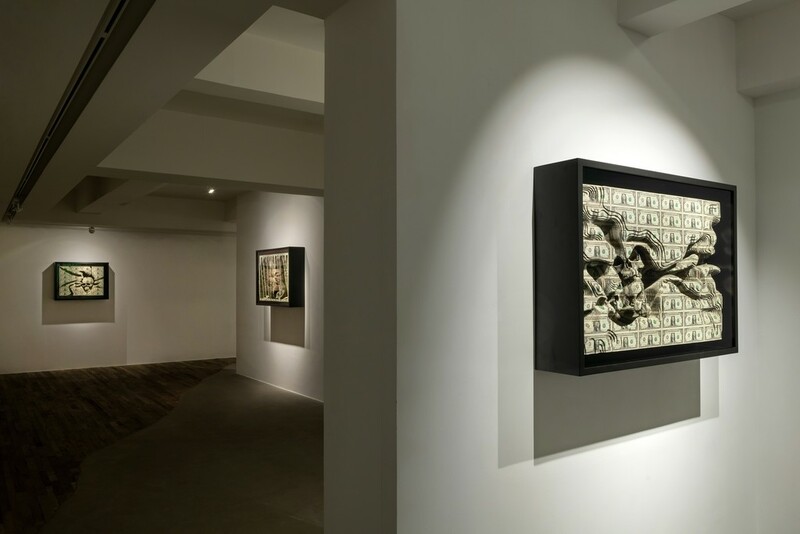 Through a distinct and creative technical approach, Campbell exactingly carves symbolic imagery into sheets of uncut dollar bills. Employing a laser cutter, Campbell precisely renders large-scale sculptures of intricate design, uniquely creating the effect of a sunken relief. 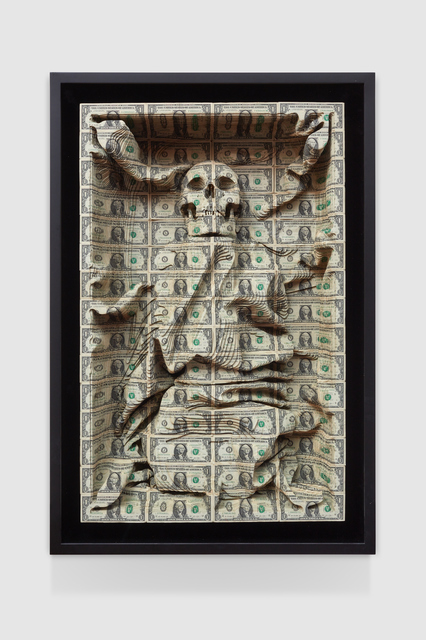 Contrasting the symbols of wealth with those of ephemerality and death, Campbell's three-dimensional money cuts proffer thoughtful questions regarding the state of the art world and the seemingly ever-proliferating role of capitalism. With ominous undertones and allusions to inevitable change and decay, Campbell's iconography references the vanitas themes found in 17th century Dutch religious paintings. 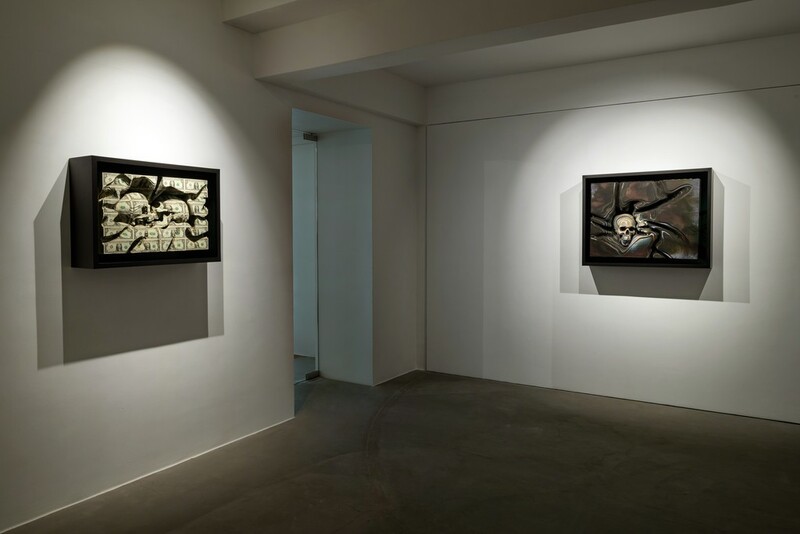 Through the artist's signature style, memento mori objects such as skulls serve as explicit reminders of the vanity of earthly pleasures and goods. Examining the relationship between commerce and aesthetics, Campbell's striking, evocative sculptures reflect the artist's broad interrogation of the transitory nature of life, particularly the role of money as a corrupting influence upon aesthetic value. 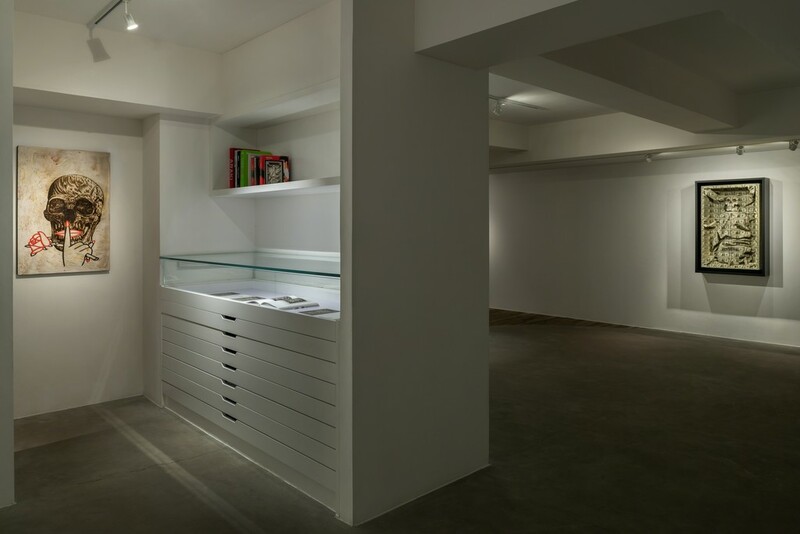 Scott Campbell (b. 1977, New Orleans, Louisiana, USA. Lives and Works in Los Angeles, CA, USA.) Campbell is known throughout the world as being one of the most talented hands in the world of tattooing. After abandoning a career as a biochemist at the University of Texas, he fled to San Francisco, and began tattooing. 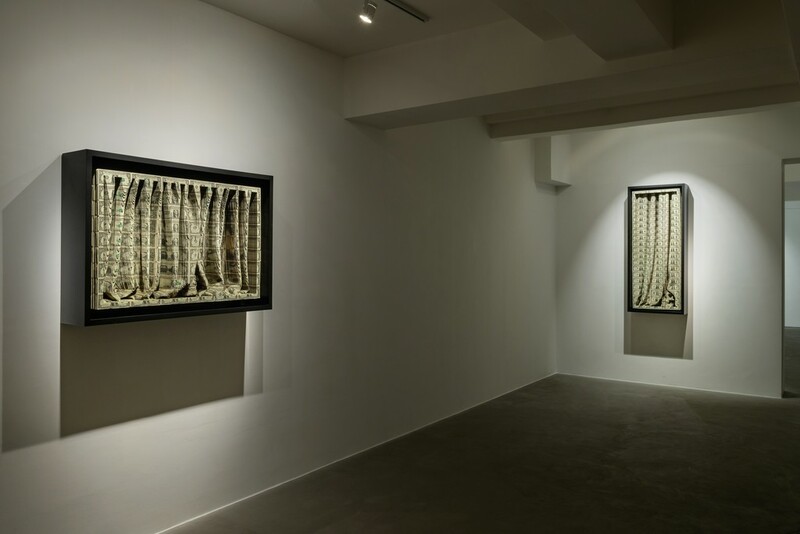 In recent years, he has gained much acclaim from fine art communities worldwide for his work in mediums other than skin, including intricately carved sculptures made out of US currency, a series of watercolor paintings based on his experiences during a 6 week stay in a maximum security prison in Mexico City, and graphite drawings done on the insides of eggshells. 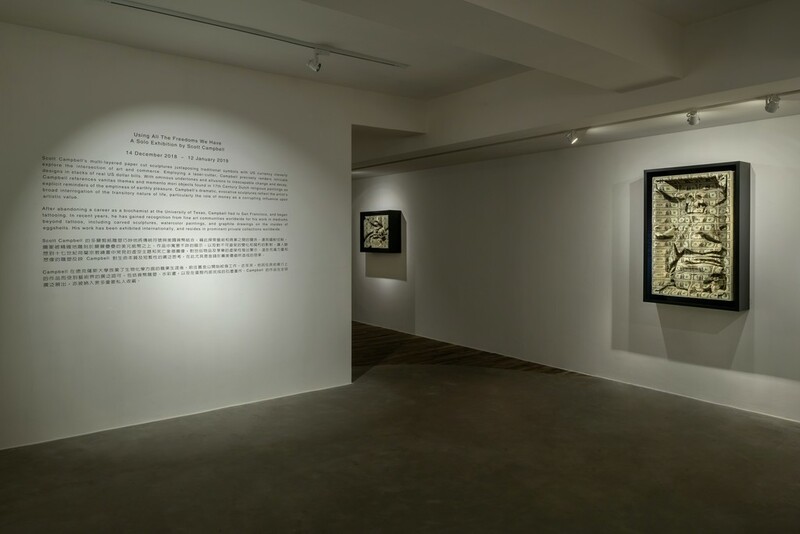 Campbell has had solo exhibition internationally including The Garage Museum of Contemporary Art (Moscow, Russia), Moran Moran formerly OHWOW (London, Los Angeles, New York), Galerie Gmurzynka (Zurich, CH), Garlerie d’Art Delphine Pastor (Monaco), Lazarides Gallery (London, UK) and Massimo Carasri Gallery (Milan, IT).